Brigid is a Clarity Coach working with clients who are ready to radically embrace their stumbling blocks to become more acquainted with the landscape of their inner lives. Brigid knows how hard it can be to do the inner work, slay the dragons and face the scary uncertainty of change. That’s why she walks alongside her clients, letting the discomforts of uncertainty run their course and while building a new network of tools, understanding and inner resolve. Brigid has implemented her surefire strategies for success in helping herself to come through her own stumbling blocks of living with panic disorder. With over 500 hours of coaching one on one. She has led her clients to victory in making positive changes in their own lives, one bite-sized action step at a time. For those who like to leap, she’ll meet you there too! With her talents of women’s empowerment, mediumship, Master Reiki Teacher, Shadow doula, and Toltec mastery. She also finds time for her self-care practices and passionate portals of expression. 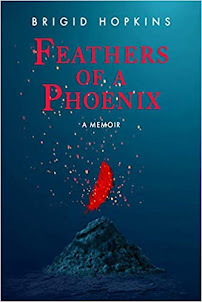 Brigid has authored and published her first memoir; Feathers of a Phoenix released 2018. When she is not working with clients, spending time with family or friends. You may find her penning away at a local coffeehouse, exploring the shores of Lake Erie, or rubbing behind the ears of any furry creature she may happen to encounter.